Our very popular Mindful Yin Yoga workshop with Emilia is back on Sunday 4th November from 10:45am - 1:30pm. A real treat for the body, mind and spirit as we welcome the dark winter season. This workshop uses Mindful Yin Yoga and Mindfulness (MBSR) with elements of Restorative Yoga to create a space of allowing a deep letting go at all levels. We will complete the practice with Pranayama (breathing practice) to bring profound sense of internal balance and harmony. All levels of experience welcome. Available on MoveGB. Book now with Emilia if you like to come attend the excellent yoga workshop! We have just scheduled a wonderful yoga for stamina workshop in September with Travis. He has studied with many teachers across the country and have been teaching since 2012. Travis has a British Wheel of Yoga diploma in teaching yoga and is one of our most popular teachers at Bristol Yoga Centre. Places are limited and we are now opened for booking so get in touch if you like to come along! Get in touch with Travis to book your place. All our teachers are highly experienced and amongst the best trained in Bristol. We have specifically selected these workshops to help you re-start your practice after Christmas and New Year. Come along to this wonderful 2 hour Restorative Yoga workshop on Sunday 19th November from 2 - 4pm to deeply release stress and tension. Spaces are limited to 12 students and it's starting to fill up so get in touch with Naomi soon! It will be a very relaxing afternoon with restorative postures, rejuvenating breathing techniques and a short meditation practice. I'm excited to announce that Sara-Jo is doing a lovely Yoga for Backs workshop on Sunday 29th October from 11:00am -13:00pm. This is a therapeutic class focusing on alleviating and managing back problems. The class will end with a rejuvenating relaxation. 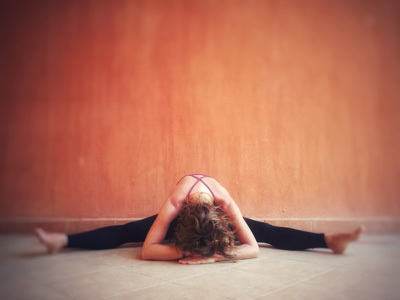 Sara-Jo teaches weekly yoga for backs class on Tuesdays at 16:30 - 17:30pm at the Bristol Yoga Centre and is one of the few registered teacher for Yoga for Healthy Lower Backs. She is also currently studying iRest Yoga Nidra, which is a highly effective relaxation technique. The workshop will be a great way to get a taster of the Yoga for Healthy Lower Backs 12 Week Course that's starting in November. More information on this course will be available very soon on our website. In the mean time, feel free to contact Sara-Jo for more information. New yoga workshop on neck and shoulder tension relief on Sunday 1st October with Naomi from 2-4pm! This is an enjoyable 2 hour therapeutic yoga workshop focusing on releasing upper body tension. Everyone including beginners and more experienced students are welcome and it's also available on MoveGB. Kate Fox's popular monthly Scaravelli Yoga on Sundays are now back! We have two dates scheduled so far: Sunday 17th September & 15th October 2017 from 11:30 - 13:30pm. Not sure what Scaravelli Yoga means? Read this blog on Scaravelli Yoga to find out more information. After the success of yoga for relaxation and stress relief workshop, I have decided to schedule another yoga workshop. The next workshop will be on balance and I will shortly be posting a new blog on this topic too. The workshop will cover postures, breathing practice, relaxation techniques and meditation. We will take a look at the philosophy of the five points of yoga and explore how to create a balanced yoga practice. This workshop will allow you more time than usual to delve into your yoga practice more deeply. Everyone is welcome including beginners and more experienced students. Click here for more information on this workshop. It's recommended to book early as there is limited spaces available.